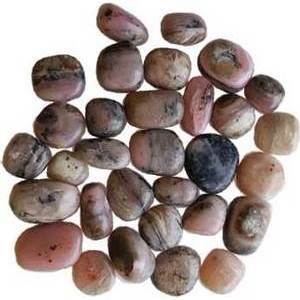 Pink opal, also known as the "stone of renewal", fill your aura with peaceful energies, and tranquility with this pink tumbled opal. It is a powerful crystal for emotional balance and healing for matters of the heart, it aids in helping to bring resolution, aiding in your journey of self acceptance and love. Fill your aura with peaceful energies, keep calm and centered. Sold by approximate weight - not stone size or count. 26 - 32 stones. 3/4" x 1" - 1" x 1 7/8"